1. Preheat the oven to 180°C, gas mark 4. Calculate the cooking time for the gammon based on 55 minutes per kg plus 30 minutes. Place in a deep roasting tin, keeping the string on, then add the wine, hot stock, onion and peppercorns. Cover loosely with foil and place in the oven. a board. Pour the stock into a medium pan and set aside, then line the tin with baking parchment (this helps with the washing up as it stops the sugar in the glaze burning onto the tin). 3. 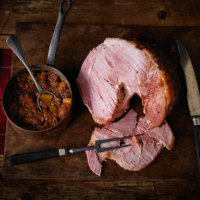 Using a sharp knife, remove the string from the gammon and cut away the skin, leaving the fatty layer beneath intact. Score the fat diagonally, then stud each diamond with a clove. Smear the mustard over, pat on the sugar, then return the gammon to the lined tin (clove-studded side uppermost) and cook in the oven for the remaining 30 minutes. 4. Meanwhile, to make the relish, place the fruit, sugar and vinegar in a pan with half the reserved stock and an equal quantity of cold water. Bring to the boil and simmer rapidly, uncovered, for 20-25 minutes, or until the mixture has thickened to a jammy consistency. Place in a serving dish and allow to cool. 5. When the gammon is fully cooked, remove from the oven and place on a serving platter. Allow to stand for 15-20 minutes before serving with the relish.